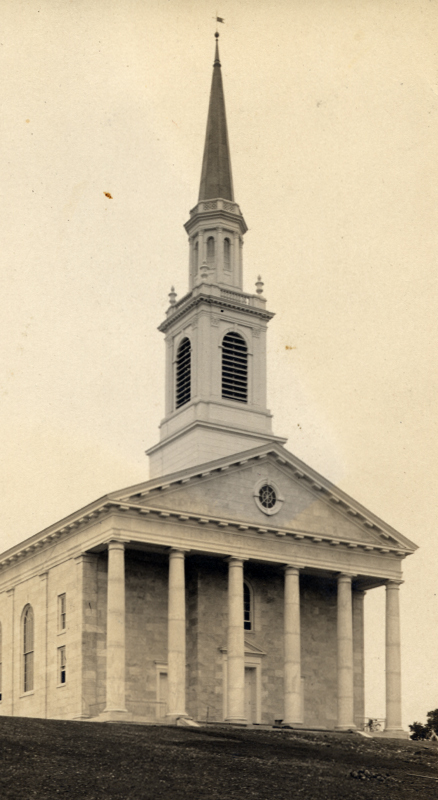 2016 marks the centennial celebration of Mead Chapel, dedicated on June 18th, 1916. 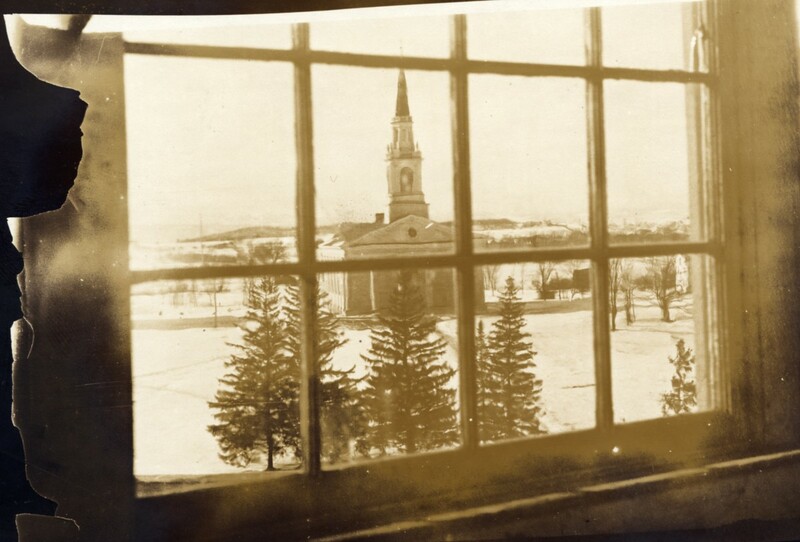 In 1914, former governor Dr. John Mead, class of 1864, fulfilled President Thomas’s desire for a space large enough to accommodate the entire student body and faculty, pledging $60,000 to construct Mead Chapel in honor of the fiftieth anniversary of his graduation from Middlebury. To commemorate the hundred years of the strength of the hills, Special Collections’ DLA fellow Sam Cartwright ’18 created a series of then and now images. Using archival materials from postcards to scrapbook photos along with his own photography, he fashioned interactive sliders to showcase how this structure has embodied “the strength of the hills” over the last century, featured on the Special Collections & Archives blog here and here. 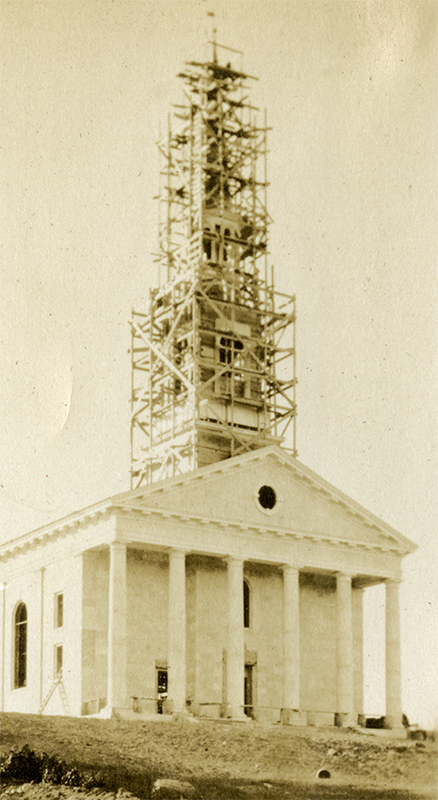 The photograph that shows scaffolding around the “Federal tower” comes from the scrapbook of Arthur Thomas Vaughn, Class of 1917, and the completed Mead Chapel image was featured on a 1916 postcard. 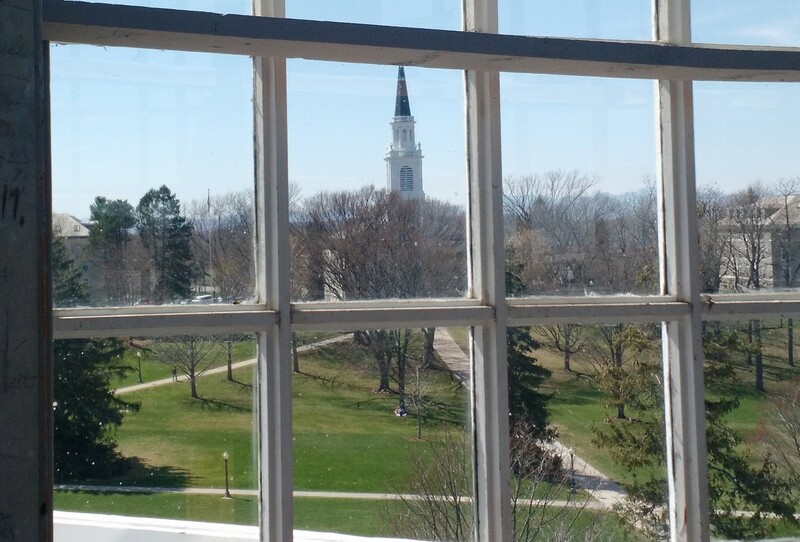 The “now” image was captured by Sam Cartwright ’18 on a Special Collections staff jaunt to Old Chapel’s cupola. 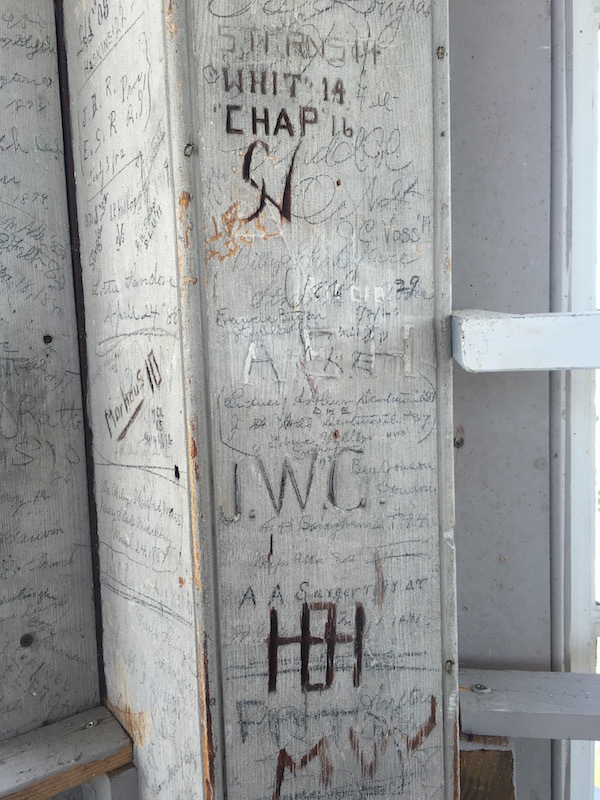 While the vista from the top offered a new perspective of our campus, the interior view gave us insight into the past – in the form of vintage student graffiti. and “Chap ’16,” George Hamilton Chapman of Worcester, MA, born 1891. 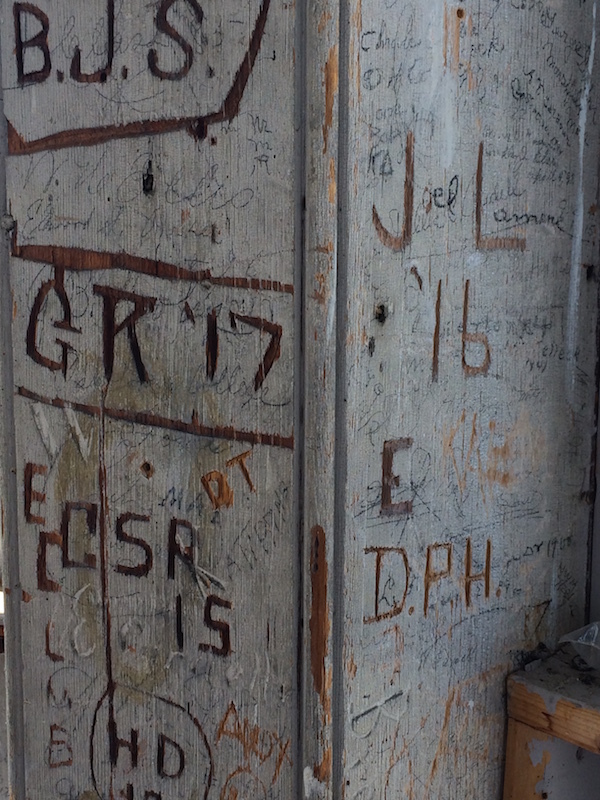 Whether by erecting a new chapel or carving initials into an old one, Middlebury’s alumni leave their mark on campus for centuries. Source: Stameshkin, David M. 1985. The Town’s College: Middlebury College, 1800-1915. Middlebury, VT: Middlebury College Press. Do we know if Mead Chapel is still “a space large enough to accommodate the entire student body and faculty”? What is the seating capacity? Congratulations to Sam Cartwright. This looks like it was a fun project. Thank you Michele! The current capacity for Mead Chapel is 1,098. So, no, the College outgrew Mead decades ago. President Thomas wouldn’t recognize the Middlebury of today, I suspect.